The Confederacy has been on my mind the last couple of weeks. I have connections with the South as does my wife. I went to high school in Little Rock where my parents still live. The name of the high school in Tyler, Texas from which my wife graduated was “Robert E. Lee,” no less. 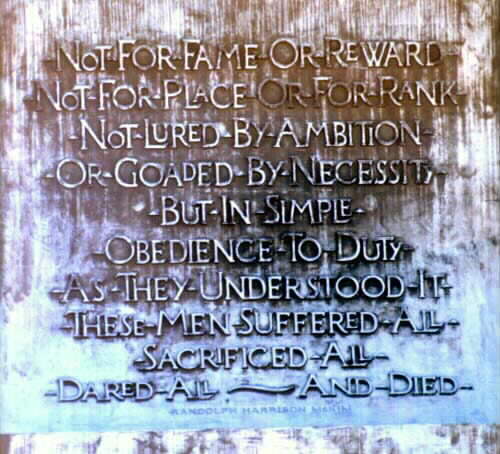 In my reading, I discovered the plaque, pictured above, located on the Confederate monument in Arlington National Cemetery. I am struck by the line: “in simple obedience to duty as they understood it…“. “…as they understood it…” That’s an interesting phrase. I’m not sure of the intent of the author who wrote it, but is he leaving open the possibility that “they understood it” wrong? History is filled with examples of “understanding it” wrong. “The Bible clearly teaches, starting in the tenth chapter of Genesis and going all the way through, that God has put differences among people on the earth to keep the earth divided.” 1980, Bob Jones III, defending Bob Jones University’s policy banning interracial dating/marriage. Each belief and action stated above was based on what was read in Scripture. These folks were dead certain that they stood on solid Biblical ground (Mark Noll writes in The Civil War as a Theological Crisis that “the Bible was the prime authority to defend the legitimacy of slavery.”). Are they just guilty of misunderstanding? What do these examples say about the “The Bible says it, that settles it!” approach to Christian living? How can people who were so sure of the Biblical justification for their beliefs and behaviors now be seen to be so wrong? Maybe I need to hold my own interpretation of Scripture lightly. Maybe I need to interpret Scripture more in light of the person of Jesus than anything else.